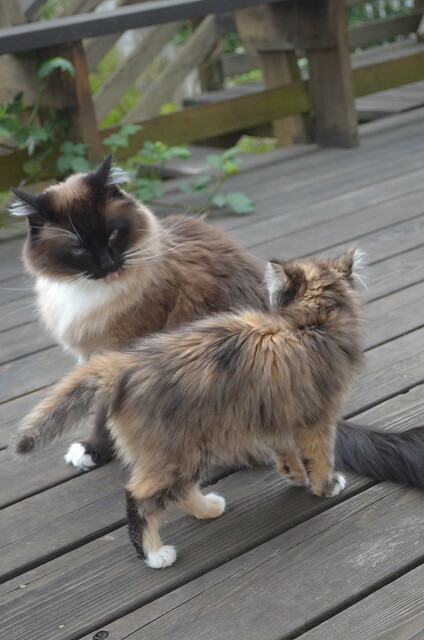 While Craig tended to a few weeds in the yard, the cats and I spent a few moments on the deck last night. 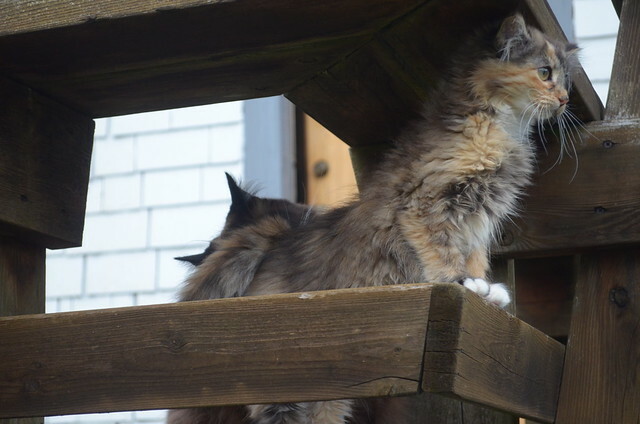 There was a nice little breeze, which the girls seemed to enjoy. It carried interesting smells, tickled their whiskers and whisked through their floof. Charlene took an impromptu bath while Wylla peeked over the edge and watched Craig work. Then Wylla considered leaving her post to perch on my shoulder. And for the final few minutes, hid in the lilacs and kiwi vines and spied on a few birds in the neighbor's yard. It was a brief outing, but the highlight of their day. OMG too much cuteness!! I can't look- but I can't turn away!! Wylla has gotten so big! Wonderful! Our infant Wylla is a testimonial to her care at the hands and paws of you all. My heart warms looking at your pictures. And -- your LILACS are BLOOMING???? I know what you mean about the lilacs, dale-harriet. Aren't they glorious? 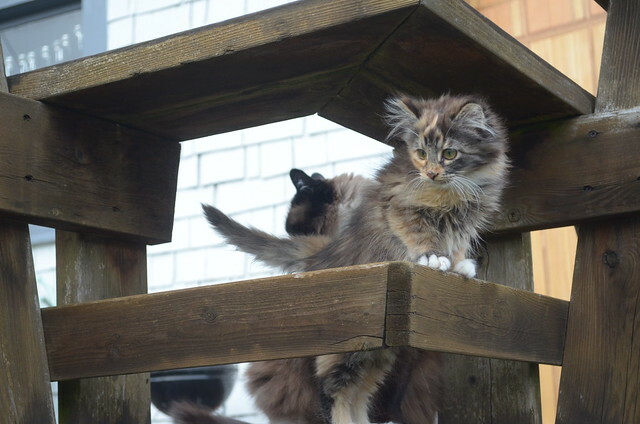 And of course, Wylla and Bean are gorgeous in the outdoor light. Even though Laurie never uses a flash, you can see what a difference this makes. My heart's so happy too. That is a lot of whiskers and floof for the wind to blow through! Nuthin' prettier than a kitty amongst the lilacs! LOVE sweet Wylla's forward-looking whiskers! Like everything else about her, just darling. PS you sure you wouldn't like a loving donation or two for the new space? I love sewing & crafting. . . Precious :) Love the one where Bean is sticking her tongue out at Wylla! She gets more beautiful by the day! Oh, Wylla. What a little sweetheart, such an open and happy face. She looks like she'd be a perfect nap-cat, the sort that would curl up on your chest and purr until she fell asleep. So lovely to see the two of them together outside. Wylla looks so much bigger these days--it's hard to imagine that she has ever had any health problems. 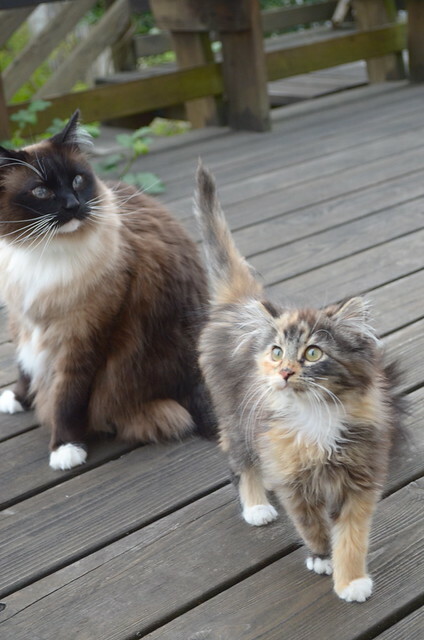 Two of the most beautiful cats in some of the loveliest pictures. Thank you for sharing them with us. Loving the white glove show! Do you ever worry a kitten might take off into the yard? No, not at all. The deck is five feet off the ground and I am standing right there. her without a lease and supervision! More pictures with these beauties and the lilacs!! What a great combo. Wylla has the most gorgeous fur! So nice to see her getting bigger, you and Craig have done a wonderful job with her! What a beautiful girl Wylla is - she's growing so well, it's all down to your hard work and love. It's so good to see the two of them enjoying some time together outside. 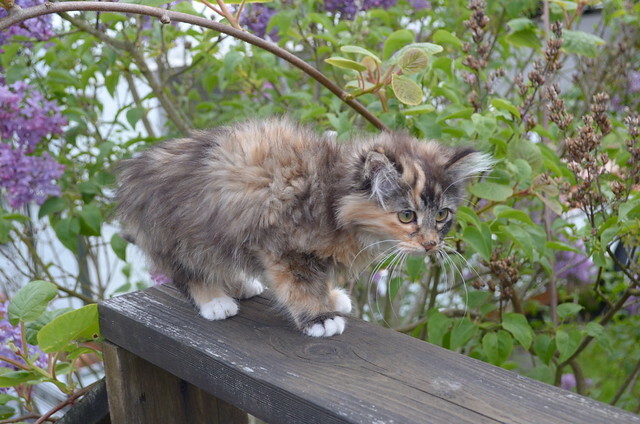 She has the loveliest coat with such bonnie markings. Those two are so naturally beautiful. I hope someone will appear to adore and pamper Wylla. There is not a prettier kitten anywhere. What a grand adventure for Wylla! Did all that exploring wear her right out? And it's the highlight of my day! There is SO MUCH FLOOF present. 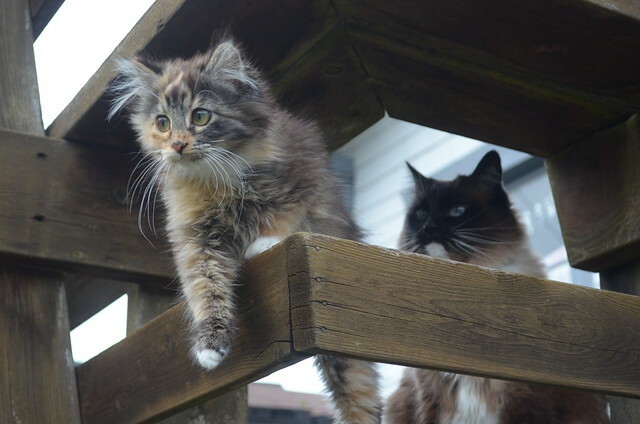 I have no idea how you manage to keep everything indoors and out so floof free. It's like the floof has permanently adhered to the kitties. Beautiful pictures of the Queen and her sidekick! Wylla just keeps getting prettier everyday. And Charlene, you are such a beautiful cat too! These pictures made me so happy! I love it when Charlene sits with her white paws kind of far apart and pointing outward. It's so cute, it just kills me! And that Wylla is getting prettier every day. My two favorite things together, floofy kitties and fragrant lilacs! 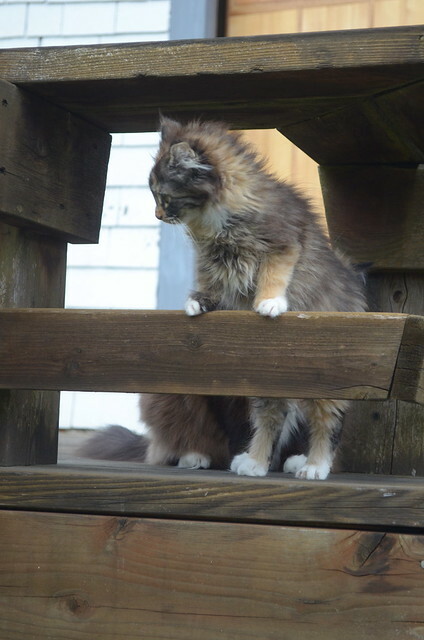 Wylla looks so sweet standing there watching Craig from the deck, too -- she looks like she's actually starting to grow into her floof. Charlene is, as always, dignity personified. 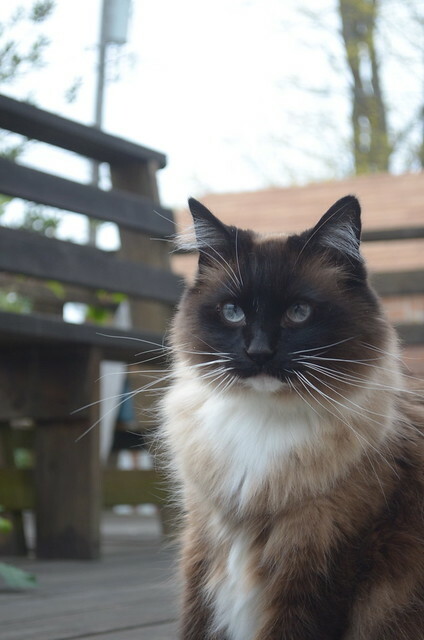 She is such an elegant cat! Aw, they look like they're enjoying themselves! Gorgeous girls! 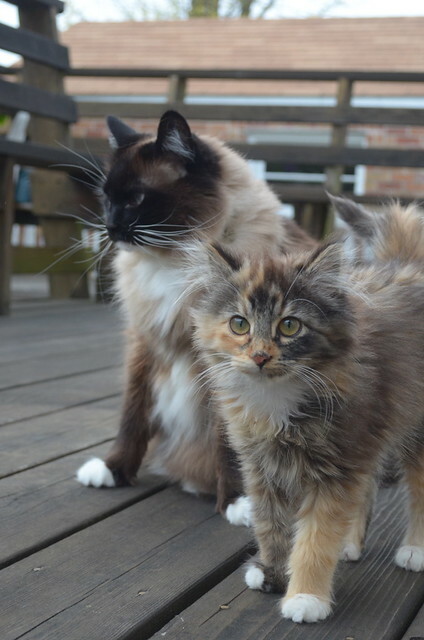 Lovely kitties on a lovely Spring evening. Wylla is looking quite happy and adorable. That Wylla has some impressive whiskers. Charlene's are pretty darned good, too. What gorgeous pictures! Wylla is growing like a weed! I'm really impressed by how well behaved they are outside, even on a harness and leash mine manage to wiggle their way out and I have to chase them down before they run up a tree. You have such good kitties! Wylla is so beautiful. I'm glad she is getting big and strong. very adorable cats, the kitten is so sweet.. I love the look on Charlene's face in #3! Looks like she's contemplating bringing down the Paw of Discipline.